Janelle Monae's album is getting great reviews, though she is still relatively under the radar. Seems like it's pretty hard being an actual artist these days. 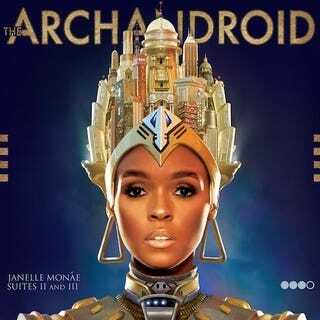 The Kansas-born, Atlanta-based R&B musician is a singing, dancing, and art-making machine… Monáe's voice-as fine a device as any in sci-fi when it comes to arguing for otherworldly intelligence-can make the hyperspace leap from its crooning, chanteuse register to the gritty exhalations required by funk… [She is] also doing something that tends to look impossible: making high art and pop talk to one another in a way that transcends gimmickry. Monáe is cute and original, with a distinctive voice and musical style, but her album debuted at 17 on the Billboard charts — below the Glee soundtrack, Justin Bieber, LCD Soundsystem, the Iron Man 2 soundtrack and Carole King & James Taylor's live album. Meanwhile, Ke$ha — who is almost the same age as Monáe — earned dismal reviews from critics. And her album hit number one on the Billboard charts. Why does buzz surround the trainwreckery of Ke$ha — from her Jack Daniels-swigging to her faux-rap to her Native American headdress — and not Janelle Monáe? Have we gotten used to showering attention (negative or otherwise) on bad girls who "act up" and exhibit bad behavior? Is real talent just not that interesting? Lord, let's hope not. Janelle Monáe's sound is infectious.